Frank Mantooth knows about timing and tempo. Applying those disciplines to a change in lifestyle, however, required some effort when he first arrived in Garden City from Chicago in the winter of 1996. In fact, it was during his initial drive to southwest Kansas, ostensibly, for a five-month artist-in-residency program at Garden City Community College, that Mantooth discovered his timing was off. "I thought I'd never get here," he recalled recently from his office in the GCCC piano lab. "When I stopped in Dodge City, and was told I still had 50 miles to go, I couldn't believe it." Mantooth, accustomed to the hurly-burly of a big city, also was concerned about adjusting to a slower everyday pace. "When I drove down Kansas Avenue for the first time, I wondered what kind of trouble I could get into here. It wasn't what I was used to," said Mantooth (who, as a schoolboy in Tulsa, Okla., would sneak into the Blue Moon club with friend Dave Teegarden, later the drummer for Bob Seger's Silver Bullet Band, to catch live jazz). Mantooth, in large part due to a fateful blind date in March of 1996, eventually found the Garden City groove to his liking, and elected to stay when his GCCC residency ended in May of that year. He's been here ever since, and entertains no thoughts of leaving soon. "There's a higher level of civility per capita here than in major metropolitan areas," said Mantooth. "At first, I wondered if (being here) would inhibit my career, but it hasn't at all. My 'in' basket is fuller than ever. ... Part of (Garden City's) charm is its remoteness. "I enjoy a lot of the aspects of living here." At the top of the list is his family, which consists of wife, Carrie; 20-month-old son, Matthew; and stepchildren, Beth, 15, Ryan, 14, and Emily, 12. Mrs. Mantooth, a "transplant" from Great Bend, taught art at Abe Hubert Middle School for eight years, and now instructs studio art at Charles O. Stones Intermediate Center. "I'm a musical illiterate," she said. "But, being from the fine arts realm, I certainly can appreciate what Frank's done." Pinpointing the day she met her future husband as March 2, 1996, Mrs. Mantooth recalled the circumstances of that encounter. "We went on a blind date with some friends, Doug and Rebecca Crotty," she said. "I was talking to Rebecca at a basketball game, both our daughters were playing, and she told me they were taking Frank out to dinner. She asked me if I'd like to come with them, and I agreed." The couple hit it off, continued dating, and were married in October 1996. "It's been wonderful," said Mrs. Mantooth. "It was easier for me to move than to move my family to Chicago," said Mantooth of his decision to remain here. "They had never lived anywhere larger than Great Bend or Garden City, and they had their friendship network and everything in place here. "Because I'm primarily an arranger, I could live and work anywhere I cared to. So, I didn't have to relocate. But I do travel every weekend." Mantooth, who turns 52 in April, was born in Tulsa, where he began piano lessons at the age of 7, developing an interest from watching and listening to his mother and older sister. "My mother was a pianist in Tulsa public schools, and my sister played, so it was a case of 'monkey see, monkey do' for me," said Mantooth, who took to the instrument almost instantly. "I remember being able to play melodies back early on. That evolved into perfect pitch, which has come in handy." While at Tulsa Edison High School, Mantooth was influenced heavily by two "really top-shelf" band directors: the first being Rick Cox, "a great guy and role model who introduced jazz band into the curriculum," and then Ashley Alexander, "one of the pioneers of the 'super bone,' a horn with both slide and valves." His continued relationship with Alexander produced four Grammy-nominated big band albums for the Frank Mantooth Jazz Orchestra, "Suite Tooth" in 1987, "Persevere" in 1990, "Dangerous Precedent" in 1992, and "Sophisticated Lady" in 1996. Also helping to propel Mantooth toward a musical career was a performance by the University of North Texas' One O'clock Jazz Band during his freshman year at Edison. "I had my socks knocked off," said Mantooth. "They made an indelible impact. I knew right where I wanted to go to school." Indeed, Mantooth received his bachelor's degree from North Texas in 1969. 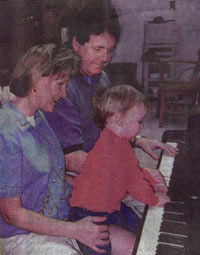 Then it was on to Austria, where he earned his piano "diplom" degree from the Vienna Hochschule fuer Musik in 1977. Since 1978, he has published nearly 150 pieces of music for jazz ensemble and combo performance, and has performed and conducted clinics the world over. At present, the alternates two-week periods at Garden City and Washburn University in Topeka, where he is Composer in Residence. A fifth album, "A Miracle," featuring vocalists Diane Schuur and Kevin Mahogany (with son, Matthew, on the cover), is in the works. And, there's Sunday's concert (ticket information appears on Page A3). "I think there's a lot of interest here (in jazz)," said Mantooth. "I'm just the conduit to bring people in and show (the community) what kind of traffic I run in." Despite nine nominations, Garden City composer/musician Frank Mantooth has "never gone" to the Grammy ceremony, and refuses to get caught up in the pursuit of winning awards. "I don't think about that," he said. "That kind of success is so subjective. ... If you can take it to heart and not to your head, it is a nice reaffirmation that people are aware of what you've tried to do, that your efforts haven't been in vain. It's recognition from your industry. But winning a Grammy is a big political maze to climb. "The thing is to make the music, get it out there, and get it played. ... Just staying afloat in the music business is difficult in this era of corporate culture. If you're one of the 'pet projects,' life's easier; but, for me, being on the outside, I'm just fortunate to be able to do what I was intended to do - write and perform music - and support myself." Mantooth's chosen genre, jazz, doesn't lend itself to mainstream or corporate approval. "Jazz is 1.5 percent of the listening market, so I'm not going to put a dent in the Madonna or Michael Jackson audience," said Mantooth. "It has to be self-fulfilling. To tell you the truth, a good deal of my income comes from airplay residuals in Europe. They're a lot more jazz-conscious over there. "Genuinely, my desire is to assemble the best players in my power to put together, and improve the music each outing. ... Any awards gleaned from that are unexpected and secondary. You're already on to the next disc." 1987: Best big band album of the year, "Suite Tooth." Trumpet solo of the year, Bobby Shew on "If the Shew Fits" from "Suite Tooth." 1990: Best big band album of the year, "Persevere." 1992: Best big band album of the year, "Dangerous Precedent." Best arranger, Mantooth for vocalist Kirsten Gustafson's album "You Taught My Heart To Sing." Best piano solo, Mantooth on "It Don't Mean a Thing, If It Ain't Got That Swing" from "You Taught My Heart To Sing." 1996: Best big band album of the year, "Sophisticated Lady." Best arranger, Mantooth for "One For My Baby" from "Sophisticated Lady." Best engineer, Freddie Breitberg, co-producer, "Sophisticated Lady." Mantooth will also receive the Florence Crittendon Award as "citizen of the year" in Kansas (past honorees include Nancy Kassebaum-Baker, Gov. Bill Graves and Barbara Bush); and was awarded the Homer Osborne Award at the Wichita Jazz Festival for his contributions to jazz education. Reprinted with permission of The Garden City Telegram.